Doctors must speak only Bahasa Malaysia or English when discussing a patient’s progress during ward visits, Deputy Health Minister Dr Lee Boon Chye said. He was responding to the controversy that erupted after the New Straits Times (NST) reported a practice among some senior doctors who use Mandarin and other Chinese dialects while discussing medical cases with their colleagues, even if some were unable to understand the language. “Communication during ward rounds, when it involves doctors and nurses must be done using only English or BM. “Stop doing ward rounds using languages other than the two,” Dr Lee told the NST. But he also clarified that direct doctor-and-patient communication can be in another language. “Communication between patient and doctors is generally done using a patient’s language, or in a language the patient can understand. “Verbal communication between a doctor and another is a private matter, even if it is work-related,” he was quoted saying. Dr Lee said he expected immediate compliance with the order, explaining that medical records only used BM and English, and should be the only languages of communication used in the wards between doctors. 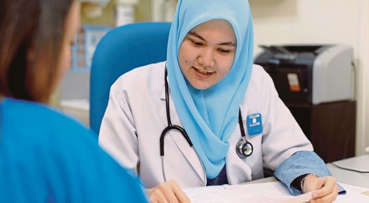 Citing a survey of nearly 100 doctors in July, NST reported 80 per cent had experienced medical discussions during ward rounds in which they were unable to follow due to the language used. The newspaper added that based on the survey, such a practice was prevalent in the Penang General Hospital, the Seberang Jaya Hospital, the Ipoh General Hospital, the Sarawak General Hospital in Kuching, the Queen Elizabeth Hospital in Kota Kinabalu, and certain medical departments in Sultan Ismail Hospital and Sultanah Aminah Hospital in Johor Baru.